If you are new to the fire dancing, spinning, twirling and performance community/communities, you may find some confusion when people discuss these terms. While many people may not draw distinctions between the art of fire twirling, spinning, dancing and performance, Temple of Poi sees each of these as their own unique pursuit. This article endeavours to explain some subtle differences Temple of Poi notes between these different ways of approaching the art form. 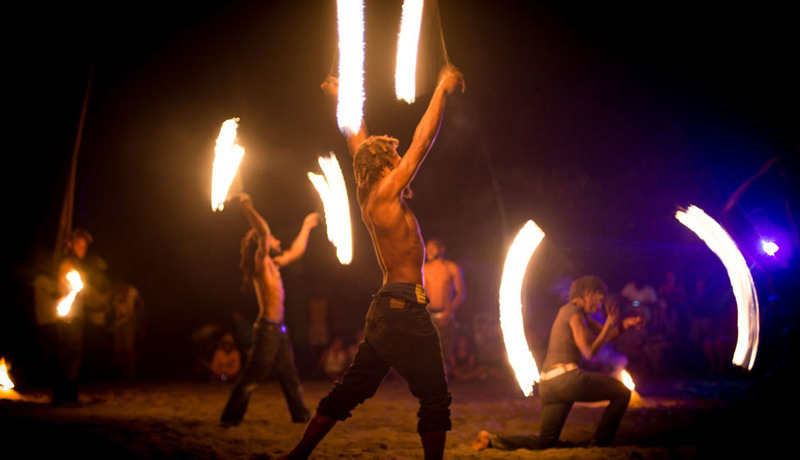 By understanding these differences, artists will also notice ways in which they can improve their style and incorporate elements of all aspects of the fire arts as fire dancers, spinners, twirlers and performers. The most important thing to note about how we use the terms fire performance, spinning, twirling and dancing is that we are using the terms to differentiate between various skills one can acquire while using tools. We are not saying that one focus is better than another, but rather, that they are all different. Everything we write below articulates our opinions about these words/styles/names and is not intended to be taken as the only opinion on the subject. Fire dancing is the art of dancing with fire tools. Fire dancing often finds the artist self-identifying as someone who enjoys body movement and a "dancer" even when they are not spinning flow tools. Fire dancers perform with more turns and traversing a lot of space, adding a lot of body movement to the performance, often preferring to dance to music (or drums) than perform in silence. They may focus on the subtlety matching movement of the body and poi to the rhythm and flow of the music and on particular combination/sequence with split-second transitions that are smooth and seemingly easy. Their mastery of flowing self-expression through dance may be lost on less educated crowds who simply see their performance as making it look easy and fun. Fire dancing focuses on creating a visual experience to match the auditory journey, focusing on self expression over technical skills. Fire spinning is the art of using tools to create patterns of fire around the body. Fire spinning often finds the artist self-identifying as "technical" and someone who enjoys "tricks"/"tricky moves." This may include moves whose complexity can not be distinguished by the common viewer as different than less complicated versions of the same move. As such, technical subtleties are often lost on less educated audiences. Fire spinners often spin at a consistent speed using fewer turns and less body movement in the performance. Fire spinners often find music irrelevant to the performance and will spin the same thing in silence as they might to music. Fire spinning often focuses on performing as many tricks as possible during each set, giving preference to technical skill over self expression.